An example of a new map identifying potential chunks of ancient oceans now located deep inside Earth. A vote map at 1400 km depth has been projected to the surface, and is overlain with the position of the continents (grey-white) at around 120 Million years ago. Credit: G Shephard (CEED/UiO) using GPlates software. This guest post is by Dr Grace Shephard, a postdoctoral researcher in tectonics and geodynamics at the Centre of Earth Evolution and Dynamics (CEED) at the University of Oslo, Norway. 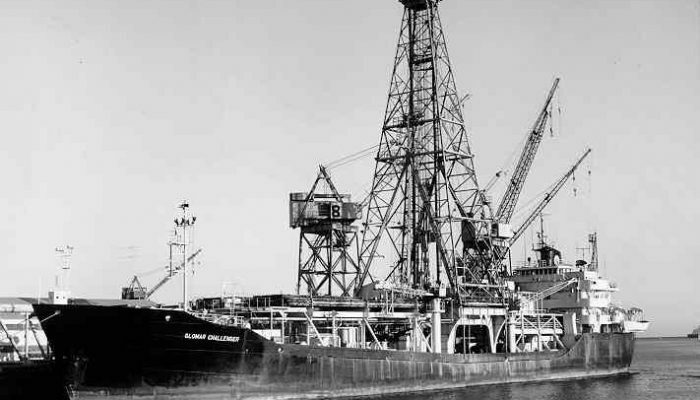 This blog entry describes the latest findings of a study that maps deep remnants of past oceans. Her open access study, in collaboration with colleagues at CEED and the University of Oxford, was published this week in the Nature Journal: Scientific Reports. This post is modified from a version that first appeared on the CEED Blog. There are several ways of imaging the insides of the Earth by using information from earthquake data. When these different images are viewed at the same time, a new type of map allows geoscientists to identify the most robust features. These deep structures are likely the remains of extinct oceans, known as slabs, that were destroyed hundreds of millions of years ago. The maps are computed at different depths inside the Earth and the resulting slabs can be resurrected back to the surface. Along with a freely available paper and website, the analysis yields new insights into the structure and evolution of our planet in deep time and space. The surface of the Earth is in constant motion and this is particularly true of the rocks found under the oceans. The crust – the outermost layer of the planet – is continually being formed in the middle of oceans, such as the Mid-Atlantic Ridge. In other places, older crust is being destroyed, such as where the Pacific Ocean is moving under Japan. A third type of locality sees the crust shifted along laterally, such as the San Andreas Fault in San Francisco. These three types of locations are often referred to as plate boundaries, and they connect up to divide the Earth’s surface into tectonic plates of different sizes and motions. Where plates plunge into the mantle are termed subduction zones (red lines Figure 1, below). The configuration of these subduction zones has changed throughout geological time. Indeed, much of the ocean seafloor (blue area in Figure 1) that existed when the dinosaurs roamed the Earth has long since been lost into the Earth’s mantle and are now known as slabs. The mantle is the domain beneath the outer shell of our planet and extends to around 2800 km depth, to the boundary with the core. The age and fabric of the seafloor contains some of the most important constraints in understanding the past configuration of Earth. However, the constant recycling of oceans means that the Earth’s surface as it is today can only tell us so much about the deep geological past – the innards of our planet hold much of this information, and we need to access, visualize, and disseminate it. Figure 1. A reconstruction of the Earth’s surface from 200 Million years ago to present day in jumps of 10 Million years. Red lines show the location of subduction zones, other plate boundaries in black, plate velocities are also shown. Continents are reconstructed with the present-day topography for reference. Based on the model of Matthews et al. (2016; Global and Planetary Change). Credit: G Shephard (CEED/UiO) using GPlates and GMT software. Using information from earthquake data, seismologists can produce images of the Earth’s interior via computer models – this technique is called seismic tomography. Similar to a medical X-ray scan that looks for features within the human body, these models image the internal structure of the Earth. Thus, a given seismic tomography model is a snapshot into the present-day structure, which has been shaped by hundreds of millions to billions of years of Earth’s history. However, there are different types of data that can be used to generate these models and different ways they can be created, each with varying degrees of resolution and sensitivity to the real Earth structure. This variability has led to dozens of tomographic models available in the scientific arena, which all have slightly different snapshots of the Earth. For example, deep under Canada and the USA is a well-known chunk of subducted ocean seafloor (see ‘slab’ label in Figure 2). A vertical slice through the mantle for three different tomography models shows that while overall the models are similar, there are some slight shifts in its location and shape. Importantly, seismic waves pass through subducted, old, cold oceanic plates more quickly than they do through the surrounding mantle (in the same way that sound travels faster through solids than air). It follows that these subducted slabs can be ‘imaged’ seismically (usually these slab regions show up as blue in tomography models such as in Figure 2 and as shown in this video by co-author Kasra Hosseini. The red regions might represent thermally hot features like mantle plumes). Figure 2. Vertical slices through three different seismic tomography models under North America and the Atlantic Ocean (profile running from A to B). The blue region outlined by black dashed line is related to the so-called Farallon slab. While it is imaged in all three models the finer details of the slab geometry and depth are different. Model 1 is S40RTS (Ritsema et al., 2011), 2 is UU-P07 (Amaru, 2007) and 3 is GyPSum-S (Simmons et al., 2010). Which tomography model(s) should be used? Are models based certain data types more likely to pick up a feature? How many models are sufficient to say that a deep slab can be imaged robustly? To facilitate solutions to these questions, a novel yet simple approach was undertaken in the study. Different tomography models were combined to generate counts, or votes, of the agreement between models – a sort of navigational guidebook to the Earth’s interior (Figure 3). Figure 3. An interactive 360° style image for the vote map at 1000 km depth. The black and red regions highlight the most robust features (high vote count = likely to be a subducted slab of ocean) and the blue regions are the least robust areas (low vote count). Coastlines in black for reference. Image: G Shephard (CEED/UiO) using 360player (https://360player.io/) and GMT software. More depth slices and options can be also imaged at our website. A high vote count (black-red features in Figure 3) means that an increased number of tomography models agree that there could be a slab at that location. For the study in Scientific Reports the focus was on the oldest and deepest slabs, but the process can be undertaken for shallower and younger slabs, and for other features such as mantle plumes. The maps show the distribution of the most robust slabs at different depths – the challenge is to now try and verify the features and potentially link them to subduction zones at the surface back in time. One way to achieve this is to assume that a subducted portion of ocean will sink vertically in the mantle, and then to apply a sinking rate to connect depth and time. This enables pictures that link the surface and deep Earth, like the cover image, to be made. A sinking rate of say, 1.2 centimeters per year, means that a feature that existed at the surface around 100 Million years ago might be found at 1200 km depth. Many studies have started to undertake a similar exercise on both regional and global scales. However, because these vote maps are free to access, showcase a lot of different models and can be remade with a sub-selection of them, they serve as an easy resource for the community to continue this task. A bit like dessert-time discussions about the best way to cut a cake, so too are the ways of imaging and analyzing the Earth (Figure 4). Do you slice it horizontally and see things that might correspond to the same age all over the globe? Or slice vertically from the surface to see a spectrum of ages (depths) at a given location? Or perhaps a 3-D imaging would be most insightful? Whichever choice is made for the vote maps, many interesting features are displayed. By comparing the changes in vote counts with depth, some intriguing results were found. An apparent increase in the amount of the slabs was found around 1000-1400 km depth. 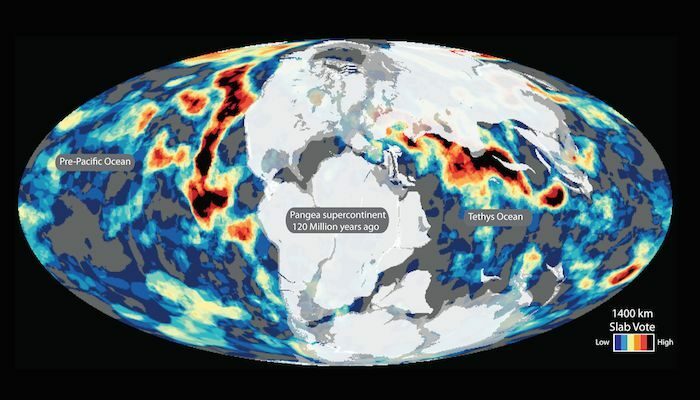 This could mean that about 130 Million years ago more oceanic basins were lost into the mantle. Or perhaps there is a specific region in the mantle that has “blocked” the slabs from sinking deeper for some period of time (for example, an increase in viscosity). The vote maps and their associated depth-dependent changes hold implications on an interdisciplinary stage including through linking plate tectonics, mantle dynamics, and mineral physics. Of course, the vote maps are only as good as the tomography models that they are comprised of – and by very definition, a model is just one way of representing the true Earth. Having accessed a variety of tomography models provided by different research groups or data repositories, this study was facilitated using open-source software (Generic Mapping Tools and GPlates). An important component of reproducible science and advancing our understanding of Earth is to make datasets and workflows publicly available for further investigations. An online toolkit to visualize seismic tomography data is being developed by the co-authors and a preliminary vote maps page is already online. Here, vote maps for a sub-selection of tomography models can be generated, including with a choice in colour scales and with overlays of plate reconstruction models. More functionality will soon be available – so watch this space! Amaru, M. L. Global travel time tomography with 3-D reference models,. Geol. Ultraiectina 274, 174 (2007). Ritsema, J., Deuss, A., van Heijst, H. J. & Woodhouse, J. H. S40RTS: a degree-40 shear-velocity model for the mantle from new Rayleigh wave dispersion, teleseismic traveltime and normal-mode splitting function measurements. Geophysical Journal International 184, 1223-1236, doi:10.1111/j.1365-246X.2010.04884.x (2011). Simmons, N. A., Forte, A. M., Boschi, L. & Grand, S. P. GyPSuM: A joint tomographic model of mantle density and seismic wave speeds. Journal of Geophysical Research: Solid Earth 115, doi:10.1029/2010JB007631 (2010). This guest post by Dr Morgan Jones (a Researcher in Volcanology at the Centre of Earth Evolution and Dynamics (CEED) at the University of Oslo, Norway) describes the latest findings of his multidisciplinary research into how the North Atlantic formed. His open access study, in collaboration with colleagues at CEED and the Massachusetts Institute of Technology (MIT) is published in the Nature Journal: Scientific Reports. This post is modified from a version which first appeared on John Stevenson’s blog, Volcan01010. Read the original post. The Earth’s tectonic plates have pulled apart and come together multiple times during its long history. These processes leave hallmarks of the past layouts of continents, which allow scientists to reconstruct how the plates have moved through time. While we know from the geological record that these movements took place, it is sometimes difficult to work out when key events occurred and their correct order. One such example is just before the formation of the northeast Atlantic Ocean, around 62-55 million years ago, when there were several changes in the relative motions of North America, Greenland, and Eurasia (the combined landmass of Europe and Asia) in just a few million years. A technique called radioisotopic dating allows us to determine the exact age of volcanic rocks. This study shows that the Greenland plate began to push against part of the Eurasian plate around 61.8 million years ago, leading to the formation of a mountain belt between Greenland and Svalbard. This precise age of first compression occurred at the same time as other changes around the edge of the Greenland plate. For the first time, this study provides evidence that these events are connected. This gives scientists who work in plate tectonic reconstructions the ability to refine their models to understand how North America and Eurasia began to break apart. The Palaeocene epoch was between 66-55.8 million years ago, occurring after the Cretaceous period. The between the Cretaceous and the Palaeocene 66 million years ago is marked by the well-known catastrophe that led to the extinction of the dinosaurs. The Palaeocene was also an important time period for plate tectonic motions in the northern hemisphere. At the time when dinosaurs became extinct, the North Atlantic Ocean was still in its infancy and seafloor spreading did not extend further north than Canada and Portugal. Over the course of the next few million years, North America and Eurasia began to break apart, which eventually resulted in a seaway that connected the Atlantic and Arctic Oceans. However, the break up was a complicated process. As the Atlantic Ocean grew northward, branches opened on either side of southern Greenland (between Canada to the west and Scotland/Norway to the east). The western arm pulled apart first, but at some point both of these rift zones were active, and a mountain range was formed in what is now Svalbard. This meant that for a short period (geologically speaking) Greenland was its own tectonic plate, moving independently of both North America and Eurasia. The aim of our study is to pinpoint exactly when Greenland and Svalbard began to push together, as this compression is directly related to the rifting further south. This means that understanding the geological history of Svalbard can shed light on when and why Greenland became its own tectonic plate. The rock outcrops in western Svalbard are intensely folded and cut by long faults. They were once part of a mountain chain that formed due to Greenland and Svalbard pushing together. This was followed later by sideways movement as the northeast Atlantic Ocean began to open; pulling Greenland and Svalbard apart. The rocks in south-central Svalbard, adjacent to this ancient mountain range, are sedimentary deposits that were formed in deltas and shallow seas. Mountain ranges often have low-lying regions alongside them (called basins) where sediments accumulate. Modern examples include the Po Valley next to the Alps in Italy and the Ganges Basin next to the Himalayas in India. Importantly, these basins form at the same time as the mountains grow, which means that techniques to work out the age of rock formations can be used to accurately date when both the basin and the mountains started to form. An important tool for working out the age of a rock is radioisotopic dating. Radioactive isotopes of elements are unstable, meaning that over time they will degrade from one form to another. The half-life (the rate at which radioactive decay occurs) of each system varies from milliseconds to billions of years, which means that different isotope systems can be used for dating, depending on how far back in time your interest lies. 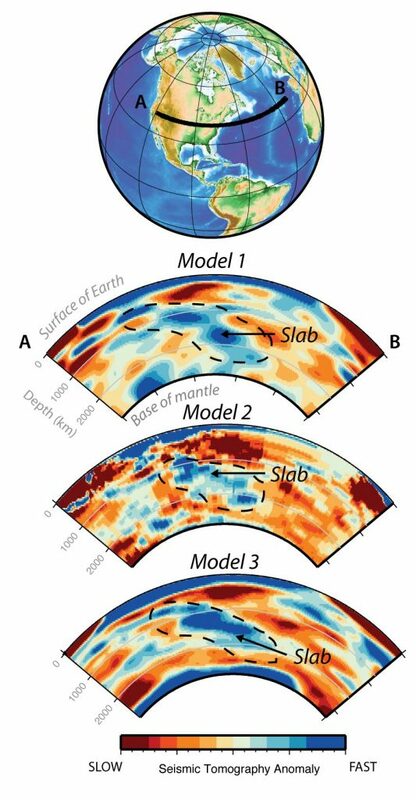 This is an edited version of Figure 5 from the paper, created using the open source plate tectonics software GPlates by Grace Shephard and Morgan Jones. It shows a regional reconstruction of how the tectonic plates were 62 million years ago. The blacked dashed lines show where the plate boundaries between North America, Greenland, and Eurasia are predicted to have been. The light blue areas show the approximate extent of seafloor in the Labrador Sea and in Baffin Bay. 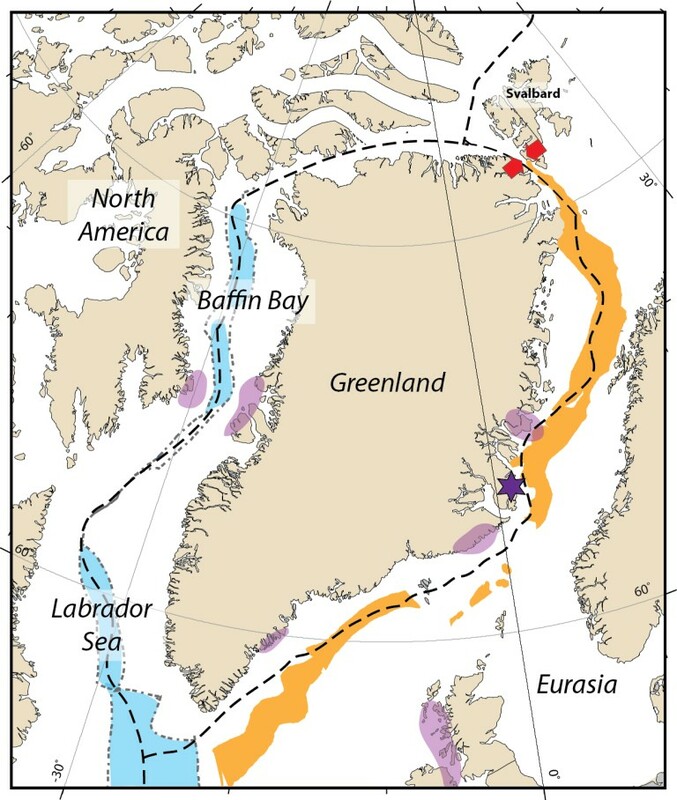 The orange areas show the rifting zone to the east of Greenland where the northeast Atlantic would later open. The purple areas show the known extent of magma intrusions and volcanic deposits from the first pulse of the North Atlantic Igneous Province (NAIP). The purple star is where the centre of the mantle plume is predicted to be at this time. The red arrows show the onset of compression between Greenland and Svalbard, beginning at 61.8 million years ago. The volcano symbols mark where the ash layers in Svalbard came from. When considering millions to billions of years in the past, uranium-lead (U-Pb) dating is used as 238U has a half-life of about 4.5 billion years. Zircon crystals are ideal for this method as they form in cooling magma chambers. Zircons can have a high uranium concentration, which means that if they are found in volcanic deposits such as lavas or volcanic ash layers, they can be used to accurately date those rocks. 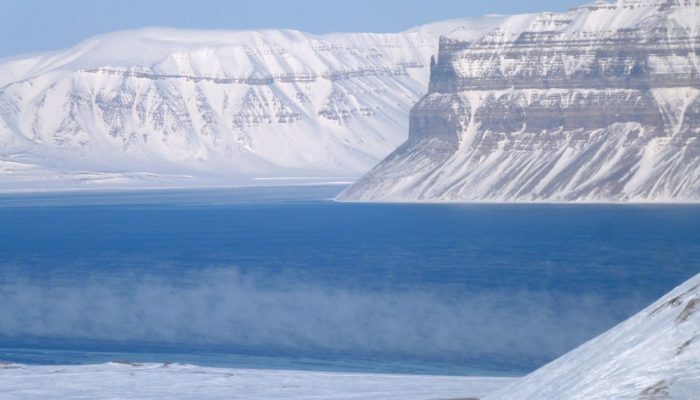 The sediments in Svalbard have numerous volcanic ash layers preserved within them. These ash layers are likely to have originated from volcanoes in northern Greenland and Ellesmere Island, now over 1000 km away across the ocean. Based on the dating of these ash layers it is possible to calculate when sedimentation first began in central Svalbard. This age of valley formation, and therefore the initiation of compression between Greenland and Svalbard, is predicted to be start around 61.8 million years ago. This age is significant because it overlaps with key events further south. Around 61.6 million years ago there was a dramatic change in the sedimentation in the North Sea from limestone to sandstone and siltstone. The speed of seafloor spreading increased between Canada and Greenland, and many faults were active along the edges of eastern Greenland. The synchronicity of these events strongly indicates a common driving force affecting all margins of Greenland. A remaining mystery is what caused Greenland to change direction. There are several possible candidates that could have caused the shift, either individually or together. The acceleration of seafloor spreading in the Labrador Sea has the potential to drive changes in relative plate motions. It is also plausible that events further afield may be important. Greenland was in between the North American and Eurasian plates, so the change in motion may be a result of forces acting on one of these much larger plates. Another possibility is the arrival of a mantle plume at the base of the crust. Mantle plumes bring considerable heat from deep in the Earth, resulting in widespread crustal melting and volcanic activity. The North Atlantic Igneous Province (NAIP) is one such example. The first pulse of magma arrived at the surface around 62 million years ago and is still causing enhanced melting today to form Iceland. The scale of volcanic and magmatic products from the NAIP is truly enormous. Current estimates put the total amount of magma at 6 to 10 million cubic kilometres. Much of this activity is still exposed along the edges of the northeast Atlantic, including the British Isles, Faroe Islands, and East Greenland. There are also considerable deposits found in West Greenland. 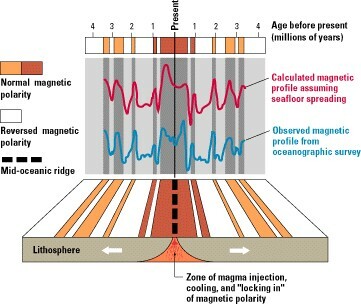 It is therefore possible that the change in plate motions may be connected to this pulse of magma. However, further work is needed to test this hypothesis. GeoTalk: The life and death of an ocean – is the Atlantic Ocean on its way to closing? Geotalk is a regular feature highlighting early career researchers and their work. Following the EGU General Assembly, we spoke to João Duarte, the winner of a 2017 Arne Richter Award for Outstanding Early Career Scientists. João is a pioneer in his field. He has innovatively combined tectonic, marine geology and analogue modelling techniques to further our understanding of subduction initiation and wrench tectonics. Not only that, he is a keen science communicator who believes in fostering the next generation of Earth scientists. I am a geologist by training. I gained my undergraduate degree from the University of Lisbon and I stayed there to research geodynamics as part of my PhD which I finished in 2012. As I was coming to the end of writing up my thesis I moved to Monash University, in 2011, to start a postdoc. Yes! I worked on my PhD and a postdoc at the same time, but I was only really finishing up. My thesis was almost ready. When I moved to Australia the defence was outstanding, but otherwise I was almost done. My PhD thesis focused on the reactivation of the SW Iberian margin. It was the very first time I came across the problem of subduction initiation and that has become a big focus of my career to date. My postdoc came to an end in 2015 and I moved back to Portugal and took up a position at the Faculty of Sciences of the University of Lisbon where I’ve started building my own research group [more on that later on in the interview]. I’ve always been passionate about science. It started when I was a kid, I’ve always been interested in popular science. My favourite writers are Isaac Asimov and Carl Sagan. 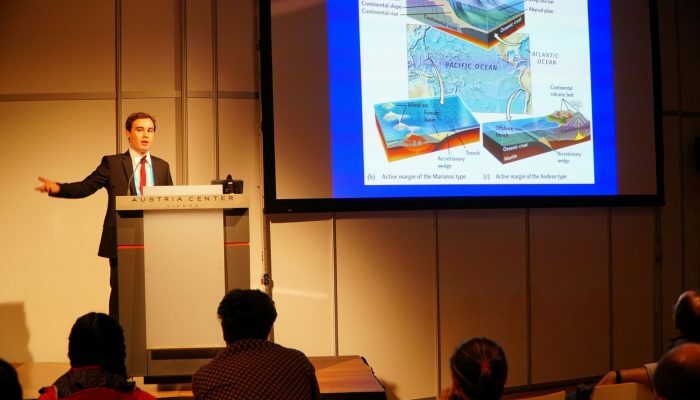 During EGU 2017, you received an Arne Richter Award for Outstanding Young Scientists for your work on subduction initiation and wrench tectonics. What brought you to study this particular field? On the morning of the 1st of November 1755, All Saints Day, when many Portuguese citizens found themselves at church attending mass, one of the most powerful earthquakes ever document struck off the coast of Portugal, close to Lisbon. It was gigantic, with an estimated magnitude (Mw) 8.5 or 9. It triggered three tsunami waves which travelled up the Tagus River, flooding Lisbon harbour and the downtown area. The waves reached the United Kingdom and spread across the Atlantic towards North America too. The combined death toll as a result of the ground shaking, tsunamis and associated fires may have exceeded 100,000 people. The event happened during the Enlightenment period, so many philosophers and visionaries rushed to try and understand the earthquake. Their information gathering efforts are really the beginning of modern seismology. But the 1755 event wasn’t an isolated one. There was another powerful earthquake off the coast of Portugal 200 years later, in 1969. It registered a magnitude (Mw) of 7.8. This earthquake coincided with the development of the theory of plate tectonics. While Wegener proposed the idea of continental drift in 1912, it wasn’t until the mid-1960s that the theory really took hold. People knew by then that the margins of the plates along the Pacific were active – the area is famous for its powerful earthquakes, explosive volcanoes and high mountain ranges. Both the 2004 Indian Ocean and 2011 Thoku (Japan) earthquakes and tsunamis were triggered at active margins. But the margins of the Atlantic are passive [where the plates are not actively colliding with or sinking below one another, so tectonic activity – such as earthquakes and volcanoes – is minimal]. So, it was really strange that we could have such high magnitude quakes around Portugal. A large European project was put together to produce a map of the SW Iberian margin and the Holy Grail would be to locate the source of the 1755 quake. The core of my PhD was to compile all the ocean floor and sub-seafloor data and produce a new map of the main tectonic structures of the margin. What did the new map reveal? Already in the 70s and later in the late 90s, researchers started to wonder if this margin could be in a transition between passive to active: could an old passive margin be reactivated? If so, could this mean a new subduction zone is starting somewhere offshore Portugal? The processes which lead a passive margin to become active were unclear and controversial. All the places where subduction is starting are linked to locations where plates are known to be converging already. 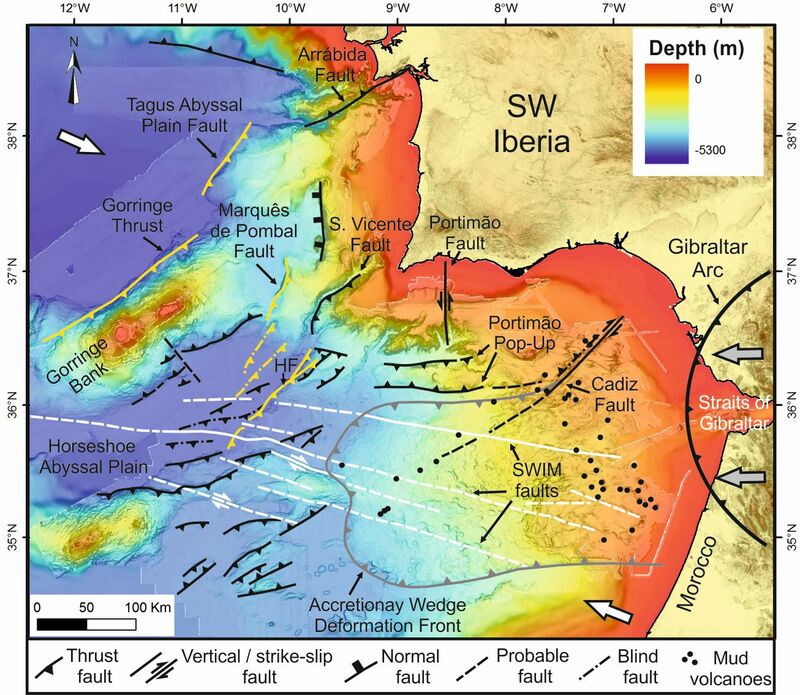 The occurrence of the high magnitude earthquakes, along with the fact that there is structural evidence (folding, faulting and independent tectonic blocks) of a subduction zone in the western Mediterranean (the Gibraltar Arc) suggested that it was possible that a new subduction system was forming in the SW Iberian margin. The new ocean floor and seismic data revealed three active tectonic systems, which were included in the map. The map shows the margin is being reactivated and allowed identifying the mechanism by which it could happen: ‘Subduction invasion’ or ‘subduction infection’ (a term first introduced by Mueller and Phillips, 1991). I’d like to stress though, that the map and its findings are the culmination of many years of work and ideas, by many people. My work simply connected all the dots to try to build a bigger picture. So, what does ‘subduction infection and invasion’ involve? Subduction zones, probably, don’t start spontaneously, but rather they are induced from locations where another subduction system (or an external force, such as a collisional belt) already exists. For example, if a narrow bridge of land connects an ocean (as is often the case) where subduction is active to one where the margins are passive. The active subduction zones from one can invade the passive margins and activate them. You see this in the other side of the Atlantic (where subduction zones have migrated from the Pacific), in the Scotia and the Lesser Antilles arcs. We also know this has happened in past. But Iberia might be the only place where it is happening currently. And that is fascinating! Earlier on you said that the ‘Holy Grail’ moment of the map would be if you could find the source of the 1755 earthquake. Did you? No. Not entirely. The source of the earthquake is probably a complex fault, where multiple faults ruptured to generate the quake, not just one (as is commonly thought). In your medal lecture at the General Assembly in 2017 (and in your papers) you allude to the fact that the reactivation of the SW Iberian margin has even bigger implications. You suggest that staring of subduction process in the arcs of the Atlantic could ultimately lead to the ocean closing altogether? The Wilson cycle defines the lifecycle of an ocean: first it opens and spreads, then its passive margins founder and new subduction zones develop; finally, it consumes itself and closes. So, the question is: if subduction zones are starting in the Atlantic will it eventually close? Most researchers agree that the next major oceanic basin which is set to close is the Pacific. The Americas (to the east) are moving towards East Asia and Australia at a rate of 3-4 cm yr-1, so it should close in roughly 300 million years. We also know that the Atlantic has been opening for 200 million years already. If you believe that the closing of the Pacific indicates that continental masses have been slowly gliding towards each other to form the next supercontinent (a theory know as extroversion); then the Atlantic has to continue to open until the Pacific closes. This would mean that ocean floor rocks in the Atlantic would be very old (up to 500 million years old!) – highly unlikely given the oldest existing oceanic rocks are 270 million years old. The map I made during my PhD showed that the Atlantic oceanic lithosphere is already starting to break-up and is weakened. All the pieces combined, I think the most likely outcome is that the Pacific and the Atlantic will close at the same time. This scenario would require other oceanic basins to form, and that’s possible in the existing Indian Ocean and/or the Southern Ocean. 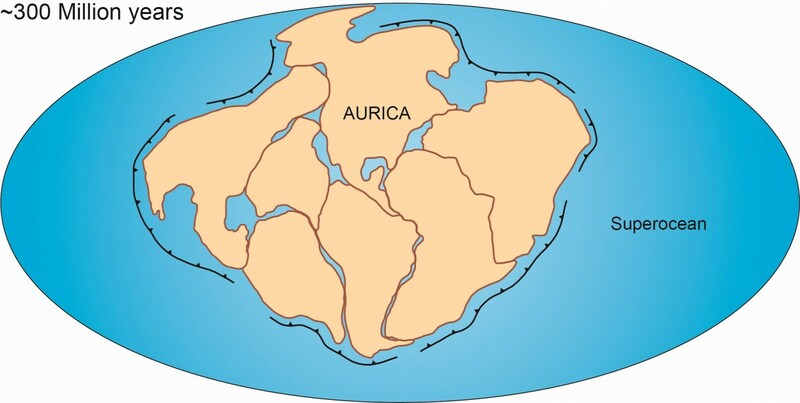 Present-day continents would be brought together to form a new supercontinent, which we called Aurica. Aurica – the hypothetical future supercontinent formed as the result of the simultaneous closure of the Atlantic and the Pacific oceans (Duarte et al., 2016, Geological Magazine). If you take into consideration present-day plate velocities the supercontinent could be fully formed in approximately 300 million years’ time. We expect Aurica to be centred slightly north of the equator, with Australia and the Americas forming the core of the landmass. With those findings, it is obvious why subduction has been a recurring theme in your career as a researcher. But what sparked your initial interest in geology and then tectonics in general? I spent a lot of time outdoors as a kid. I was always curious and fascinated by the outdoor world. I joined the scouts when I was eight. We used to camp and explore caves by candle-light! When I was 14 I took up speleology; there are lots of caves in the region I grew up in, in Portugal. As amateurs, my speleology group participated in archaeological and palaeontological work. The rocks in the region are mainly of Jurassic age and contain lots of fossils (including some really nice dinosaurs). The outdoors became part of me. I knew early on that I didn’t want a boaring job with lots of routine. I wanted a career that would allow me to discover new things. Geology was the most obvious choice when picking a degree. I felt it offered me a great way to stay in touch with the other sciences too – physics via geophysics and biology through palaeontology. In my 2nd year at university, I was invited to help in an analogue lab looking at problems in structural geology and geodynamics. I was always attracted to the bigger picture. Plate tectonics unifies everything. I like how by studying tectonics you can link a lot of little things and then bring them together to look at the bigger picture. When I found out about the award I was shocked because I wasn’t expecting it at all. I always felt I wasn’t doing enough [in terms of research output]. I think that early career scientists are being pushed to limits that are unreasonable; the competition is intense. It’s not always obvious, but there is a lot of pressure to publish. But there are also a lot of very good people whose publication record doesn’t necessarily reflect their skill as a scientist. The award made me realise I was probably doing enough! Moving to Australia was KEY. Moving and creating collaborations with different people will make you unique. You don’t want to stay in the same institution. [By doing so] you become very linear. There are a number of schemes available (like Marie Curie and Erasmus) which allow you to move. Use these to the fullest. Moving allows you to see problems from different perspectives. And you will become more unique as a scientist. There a lot of bright young scientist – never have we had so many – we are all unique, but you have to find the uniqueness in yourself. Most of all have fun. Do science for the right reasons and remember that people still recognise honest hard work (the award showed me that). Interview by Laura Roberts, EGU Communications Officer. Duarte, J., Schellart, W., & Rosas, F.,: The future of Earth’s oceans: Consequences of subduction initiation in the Atlantic and implications for supercontinent formation, Geological Magazine, 1–14, https://doi.org/10.1017/S0016756816000716, 2016.